Residents of Fedha estate in Nairobi were treated to a tantalising drama after a man was found in a married woman’s house by the giant husband of the woman. The woman jumped skillfully from first floor of the building after she was busted by the husband spending time with the well-known man in the area. Juju Jessy (pictured) did not care about breaking her legs when her enraged husband, Steven Odero arrived with three other men after receiving intelligence that the wife was entertaining another man. The victim, Ben Omondi (Also pictured) who is also known as Sirkal was beaten senseless by the four men with protruding chests before Tassia Police came to his rescue. 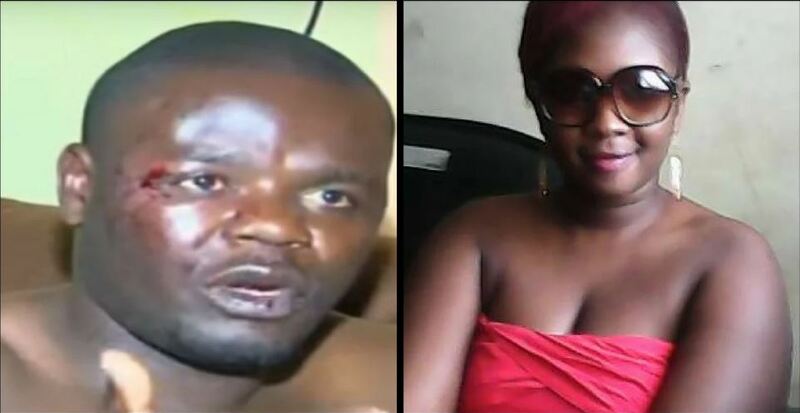 Omondi denied having an affair with Juju, claiming that she was an old friend who requested him to fix her TV. Surprisingly, Omondi’s pregnant wife came to his aid and even helped him dress up. “This is definitely a setup. He is a faithful man, and I am sure he didn’t come here to sleep with a married woman. Something is not adding up,” she told The Nairobian. He recorded a statement at the Tassia police station even as residents say there have been an increase of love-triangle cases in the area.